Scott Elbert is on the mend and believes he can help the Dodgers after the All-Star break, but Joc Pederson will now be missing from these updates for at least another week and possibly more after separating his right shoulder. Meanwhile, Corey Seager continues to excel, and Jose De Leon showed his promise. Hitter Of The Day: Corey Seager (A+) went 4-for-6 with his 27th double on the year. 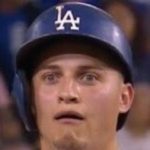 Seager now has a 1.127 OPS in his last 10, and has a higher OPS against lefties (1.133) than righties (.976). I assume the promotion is coming. Pitcher Of The Day: Jose De Leon (A+) struck out 12 and walked none while pitching seven innings of five-hit, one-run ball. A 24th round selection in the 2013 draft, De Leon struggled in Rookie-ball last year but looked dominating today. At his best, he’ll work in the low-90s from a 3/4 slot with arm-side action, and while his secondary pitches are a work in progress, his slider shows the most promise. Darnell Sweeney (AA) went 3-for-5 with his 22nd double, while teammate Scott Schebler (AA) went 2-for-5 with his 14th homer and fourth stolen base. Juan Uribe (A+) continued his march back to the Dodgers and went 2-for-5 with his second double. Lucas Tirado (AZL) went 2-for-4 with his first two doubles of the season. Takumi Numata (AZL) made his professional debut by striking out six over four inning, allowing three hits, a walk, and two runs. Dennys Chica (DSL) hurled five shutout innings on three hits and a walk, striking out six. Hitter Of The Day: Clint Robinson (AAA) went 3-for-4. Robinson was recalled by the Dodgers because of his .309/.402/.523/.925 line, along with showcasing solid plate discipline. Regardless of what he does in his stint, he’s still organizational depth long-term. Pitcher Of The Day: Yimi Garcia (AAA) pitched two no-hit scoreless innings, striking out two and walking one. Pedro Baez (AAA) followed, pitching a perfect frame, striking out one. Weird that Ned Colletti has admitted he wants to improve the pen but doesn’t give any of the kids a shot, even to work them in slowly as the last man out of the pen. Zach Lee (AAA) continues to be very mediocre, allowing seven runs (six earned), walking six, and allowing seven hits in four innings. Lee struck out only one batter. Hate to say it, but part of the reason the Dodgers are desperate for depth is because of Lee. I’m not even sure how valuable he is as a trade chip right now. Scott Schebler (AA) went 2-for-4 with his 15th homer. Corey Seager (A+) went 2-for-4 with his 28th double and 14th homer. Scott Elbert (A+) recorded two outs but gave up a solo homer and a walk. Arm didn’t explode, though, so it’s a win. Julian Leon (R) went 3-for-5. Leon has a .321/.391/.411/.801 line with six walks and nine strikeouts thus far. The over-the-fence power hasn’t shown up in games yet, but it’s there. Dennis Santana (DSL) continued his success after being converted to the mound, striking out three in 1.2 perfect innings. Hitter Of The Day: Chris Jacobs (A+) went 3-for-4 with his 19th double and 15th homer. Jacobs has amazing power and a .884 OPS. He’s also 25 in high-A. Nice way of saying don’t get excited or anything. Hit tool is simply not there. Pitcher Of The Day: Joe Broussard (R) pitched 3.2 scoreless innings, allowing only two hits and striking out two. 15th round pick from this year’s draft continues to turn in quality multiple inning outings. Darnell Sweeney (AA) went 2-for-5 with his 23rd double. Scott Schebler (AA) went 2-for-4 with his eighth triple. Alex Verdugo (AZL) hit his first homer, going 1-for-4. Lucas Tirado (AZL) struck out four times in four trips. The ups and downs will continue to come this year for the 17-year-old. Hitter Of The Day: Erisbel Arruebarrena (AAA) went 1-for-3 with three walks. Erisbel has posted a .864 OPS at this level, but there needs to be a change in swing for me to buy in. 76 plate appearances that raises his season line to a .684 OPS isn’t doing it. Matt Magill (AAA) struggled in relief again, allowing a run on two walks and two hits in 1.1 innings of work, striking out one. Fortunately, Pedro Baez (AAA) and Paco Rodriguez (AAA) combined to throw two scoreless innings. You know what I’m going to say about the Magill relief experiment already (16.1 IP/14 BB/12 K). Scott Elbert (AA) pitched a scoreless inning, allowing only a hit. Most importantly, he pitched another inning. Theo Alexander (R) went hitless again in three trips, including two strikeouts. Alex Verdugo (AZL) went 2-for-5 with his second double and his first stolen base. Scott De Jong (AZL) went 1-for-4 with his first homer and a walk. Bubby Rossman (AZL) was the Dodgers 22nd round pick in the 2014 draft and he threw two perfect scoreless innings, striking out three. Hitter Of The Day: Colin Hering (R) went 3-for-3 with his third double. 10th rounder from this year’s draft is off to a very hot start, posting a .962 OPS thus far. Though it would be more disturbing if he wasn’t, since this is his age 23 season. Pitcher Of The Day: Stephen Fife (AAA) came back with a solid, if not unspectacular outing. Over six innings, Fife stuck out just two but allowed only one run on five hits and a walk. Fife needs to find a way to keep his shoulder healthy or it doesn’t matter how he performs. Julio Urias (A+) was pegged for five innings today, but only lasted four due to pitch count concerns. Urias allowed two runs on two walks and two hits (including a homer), striking out four. Jesmuel Valentin (A) smacked two doubles en route to a 4-for-5 day that included a walk and a stolen base. Jared Walker (AZL) went 2-for-3 with a walk. Hitter Of The Day: Moises Perez (DSL) went 2-for-5. A raw 16-year-old learning on the fly and having to handle shortstop is going to have his share of struggles, but the hope is just for progress. Pitchers Of The Day: Dennys Chica (DSL) appears on this update for the second time, going five innings, striking out five, and allowing just two runs (one earned) on four hits and no walks. Gregor Mora (DSL) and Dennis Santana (DSL) followed with two perfect innings in relief. Shakir Albert (DSL) went 2-for-4 with his third double. Hitter Of The Day: Jesmuel Valentin (A) went 2-for-4 with his fifth homer. After struggling at this level something awful last year (.618 OPS), the progress this year shows (.769). Pair that with excellent defense at second base, and the California League could be an interesting option for the 20-year-old if the Dodgers want to push him a bit. Pitcher Of The Day: Greg Harris (A) went five scoreless innings, allowing two hits and two walks but striking out five. A 17th round pick from last year’s draft, Harris is a raw prospect with jerky mechanics but potential for deception and swing-and-miss stuff. After struggling in the AZL at 18 last year, the Dodgers fast-tracked him to full-season ball and he responded with 9.5 K/9 and 2.9 BB/9. Previous What If An Ump Taught Yasiel Puig How To Bat Flip?